Dairy free version using only coconut milk instead of whipped cream! Let your kids eat dessert for breakfast! I am trying to increase the amount of coconut products and lessen the amount of dairy that I use, particularly if another form of “milk” can be used with the same results. The next batch I made, I only used coconut milk and used coconut oil instead of butter. They were divine! The slight coconut taste was very nice with the strawberries. Make a few batches of these while you are messing up the blender and throw the extra ones in the refrigerator and pot them in the toaster. I honestly think they are better the next day! Notes: Dairy Free Version: Use 1-1/4 cup almond/coconut milk combo as well as 4 tablespoons of melted coconut oil. Blend eggs in blender for 1 minute. You can also blend with hand mixer. Add wet ingredients. Blend well. Add dry ingredients. Blend well. Heat waffle iron. I set it on a little darker than medium. If making waffles, spray waffle maker and measure out 1/3 cup per waffle or for pancakes. Cook to desired brownness (I like mine brown). If making pancakes, melt 1 tsp butter/coconut oil in pan set on medium heat and measure out about 2 tablespoons of batter per pancake. I usually can cook 3 pancakes per batch. 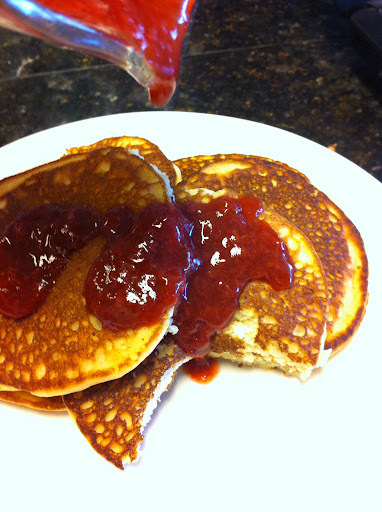 Flip pancake when you see sides are dry. I used 1 tsp of butter per batch. Made these this morning and loved them! Hubby said he loved the nutty flavor and even liked them more than regular pancakes. I didn't have coconut milk so I just subbed more almond milk. Will make them with coconut milk next time to compare. Thanks for a great recipe. The extras are going in the fridge for a meal later in the week. Tricia, so glad you liked them! I make them up in batches too and they keep well in the fridge and taste great cold or warmed in the toaster! WOWWW!! Tried these today and could not believe how delicious they are! Don't even really need anything on top. Thanks for this! If anyone is wondering, using a vegan egg replacement does not work. I just made a horrible mess! The batter tasted delicious though so I was sad it didn't work. I guess it needs the eggs. Just had these for breakfast! It felt sinful they were so good! I used a sugar free syrup on mine along with some raspberries. Never expected them to be this good! Love so many of your recipes thank you for your time and effort to share all of this! Great job! @allisonarc, so glad you liked them! It's like eating cake for breakfast! @Lyn, I have never tried an egg substitute. Please let me know if something works! 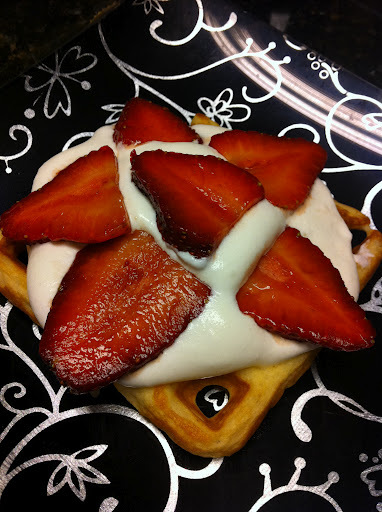 @mobilemoms, so glad you enjoyed the waffles and the blog. Always glad to share recipes with my grain and sugar free foodies! @Amy, glad you enjoyed the waffles. Make a bunch and put them in the freezer and pot them in the toaster when needing a quick breakfast! How did your children like them?? I doubled this recipe and there were still no leftovers! That's what happens I guess when you're feeding a hungry hubby and 4 kids. 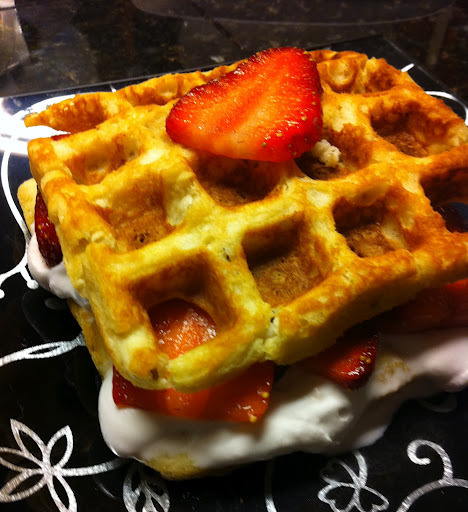 We loved your recipe for blueberry syrup with the waffles. The little bit of the syrup that we had left over was used up the next day on your cheesy biscuit recipe! Yum! Thanks for all the great recipes! First of all. I love your blog. I’m from Mississippi and your recipes are easy, and appealing. I also love how you have food that appeals to southerners and are able to find things at my local grocery. That being said, I’m in a pinch and don’t have coconut flour. Can I use extra almond flour? If so how much? Thank you again! I bought your books off of amazon. They are wonderful! Lee, glad you are enjoying my Southern Recipes. I would not try to use extra almond flour, you can try but I can’t guarantee how they will turn out. Try this recipe for waffles, it only uses almond flour: https://satisfyingeats.com/breakfast/fluffy-blueberry-buttermilk-pancakes-grain-free-low-carb/ I hope this helps!